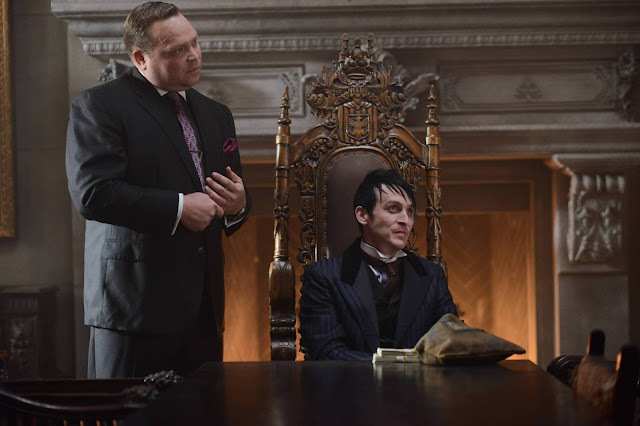 Prepare for GOTHAM with 3 New Promos for "Knock Knock"
Would you make a deal with Cobblepot? Watch him Mondays at 8/7c on FOX. Fox Television's 'Gotham' has embraced their biggest strength by putting the emphasize on the villains this season. The show has upped the ante by adding Theo Galavan (James Frain) and his deadly sister Tabitha/Tigress (Jessica Lucas) as recruiters of their own squad of villains including Jerome Valaska (Cameron Monaghan) who may or may not be a young Joker and Jim Gordon's ex-girlfriend Barbara Kean (Erin Richards) who's eating up the scenery as the devilishly wicked escaped convict. The writers found a way to make Barbara far more interesting by her emotional and mental breakdown when under the influence of the Ogre she murdered her parents. It's a dramatic change of character the writers of 'Sleepy Hollow' realized too late when they made Ichabod Crane's wife Katrina an evil witch. She became a much better foil than the constant damsel in distress throughout the season. That's an article for another day. In this series of promotional trailers for Monday's episode, 'Knock Knock,' Barbara pays Jim an unexpected visit, it's a new day for Commissioner Essen, and Gotham's Mayor has been boxed in by Galavan. People have loved or hated 'Gotham' and it's beginning to skirt the wackiness of a Tim Burton feature, but it remains to attract a large audience. It'll be interesting to see how CBS's 'Supergirl' will affect 'Gotham's numbers when it debuts on October 26.